Cryptologic brings to you the Spider-Man Revelations Slot. 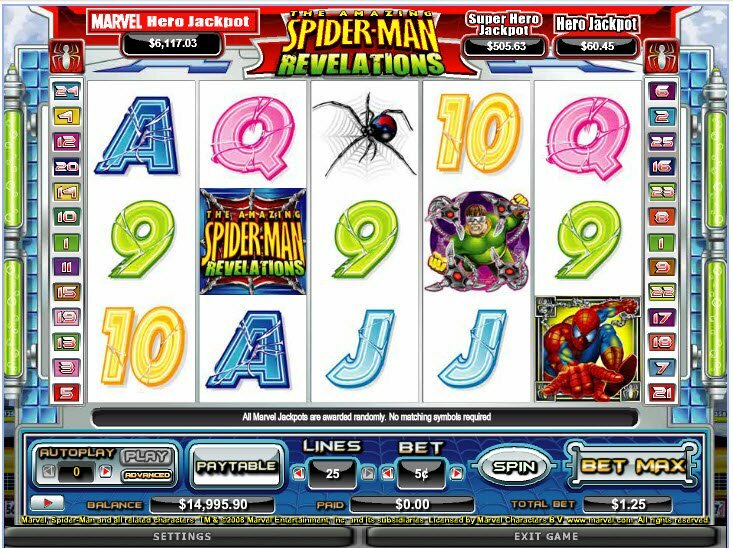 The game features a Bonus Round where you face off against the villainous Doctor Octopus to fight for Free Spins and Multipliers. Fans of the comic will enjoy the illustrations which stay true to the images of a graphic novel. 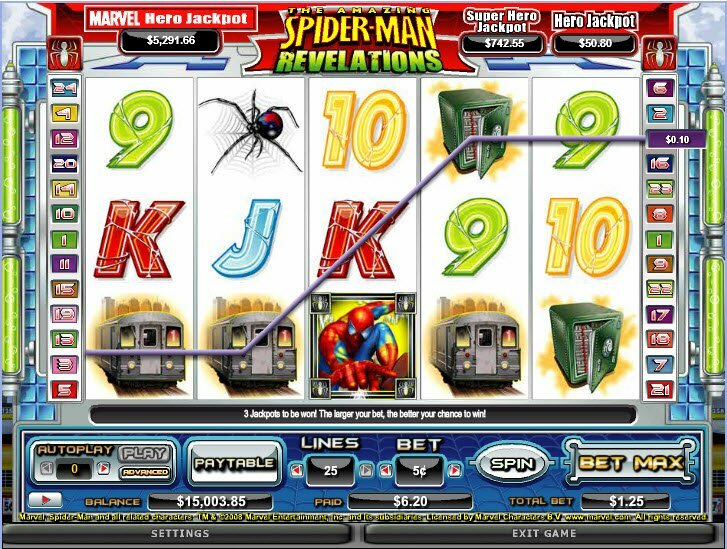 The 25 payline, Spider-Man Slot comes from Cryptologic, not to be confused with the other Spider Man Slot Games available. 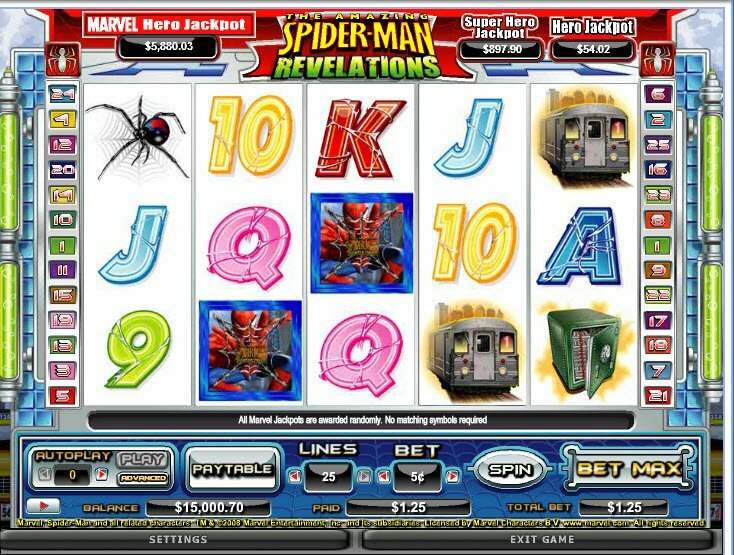 The game contains the Doctor Octopus Bonus Feature which awards Free Spins and Multipliers. The game also gives you the chance to win a Marvel Jackpot aka cash in instantly with a lot of money! This game may not look super fancy, but it does maintain the look of the Spider-Man comic book series. Landing on three of more of the Scatter symbols activates the Bonus Round in which you join Doctor Octopus on top of the train to battle for prizes. The game allows you to choose between Free Spins and a Multiplier or you can play again for a better offer. Overall, the Spider-Man Revelations Slot bonuses don't have too much going on in terms of features. It does hover contain a great Bonus Game. Landing on three of more of the Scatter symbols activates the Bonus Round in which you join Doctor Octopus on top of the train to battle for prizes. The game allows you to choose between Free Spins and a Multiplier or you can play again for a better offer. The game also contains The Spider-Man icon which serves as the Wild Symbol and substitutes for all symbols except the Scatter.